I've followed this issue peripherally for some time, but hadn't read anthing in detail for some time. Nice job. I remember in Tom Clancy's Red Storm Rising the US Navy decides to shift most of it's Pacific Fleet assets to the Atlantic. 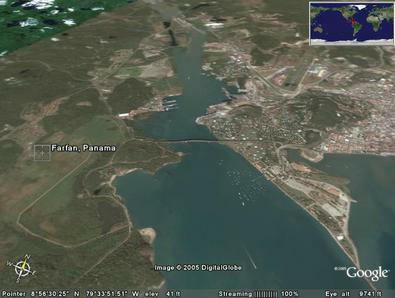 The ships of course all transit the Panama Canal. If there is a showdown over Taiwan, one can easily see where the Navy would want to quickly move ships to the Pacific. Given the moves by the PRC that you detail in this post, China is gaining such influence that they might be able to stop us simply by pressuring the Panama government to refuse us transit. Worst case, of course, they sabatoge the canal or even attack our ships terrorist-style. My question for you is, what should the United States do about Chinese moves in Central and South America, especially in Panama? How can we counter the Chinese? use the catholic church. since the end of the col war, the church has been struggling for a significant fight -- they are too christian (and associated to the crusades) to be off any significant use in the war againts the jihadists, and their social battles over gays and abortion, are IMO trite. But the church can use its heavy influence in latin america (perhaps the most strongly catholic area in the world) to cause the people of LA to demand that their leaders do not make friends with the enemies of the church that the Chinese communists are. Just as Pope John Paul II was able to leverage catholicism to fight the Soviets in eastern europe and poland, the church can fight the greatest enemy of freedom and religion in the 21st century -- a increasingly powerful China. Good point about the Catholic Church. However, the Vatican is very interested in better relations with China, especially after switching their view on Taiwan to China recently. Right, I'm with Bill. I don't see the Catholic church as being of much help with regards to the Chinese. It's not the same as with the Russians in Eastern Europe. It was announced in July 2009 that the Flemish dredging company Jan De Nul, together with a consortium of contractors consisting of the Spanish Sacyr Vallehermoso, the Italian Impregilo and the Panamanian company Cusa, had been awarded the contract to build the six new locks. The best formula for happiness is to be able to develop the ability to tolerate frustration , to have a personal involvement and commitment , and to develop self-confidence and self-esteem. Manolo Blahnik I also proud. to make a stateent! Our shoes are a big part of our wardrobe. manufactured by highly skilled workers that take pride in the products they make. •China is working to reduce Taiwanese influence in the world through its economic ties in Latin America. "Of the 26 countries that still recognize Taiwan as a free-standing nation, half are found in Latin America or the Caribbean." This is good information here. I like the information that is given here. I like that. But we have to think on this because China is getting vast to America. Nancy:You use a board, likes surfboard, but you go down hills on snow, like skiing. "Happiness is a butterfly, which ,when pursued, is always just beyond your grasp, but which, if you will sit down quietly, may alight upon you."